Most likely starting next month. Good move for him, pretty much his only move too. Him and Michael Tarver can tear it up. And since Tanahashi has been using the styles clash they all know how to take it! Swarles wrote: And since Tanahashi has been using the styles clash they all know how to take it! Same thing I was thinking (Not Tanahashi specifically, just wrestlers over there in general. I'd assume they know what they're doing). AJ just showed up,just incase any of you don't want know cause you planning on watching the show later. The Southern Rock N' Rolla, AJ Styles! 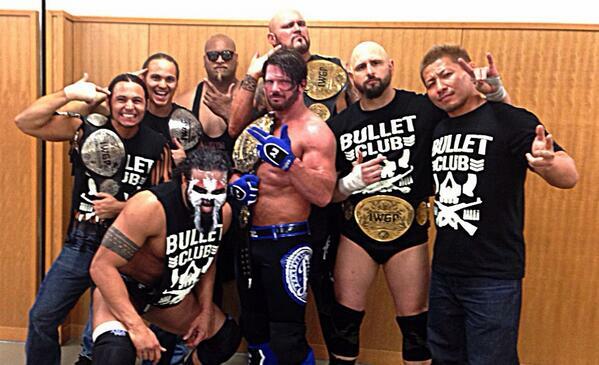 AJ Styles beat OKADA at NJPW Wrestling Dontaku 2014 for the IWGP Heavyweight Title, which is his 6th World title win. With the help of Yujiro Takahashi, whom joined the Bullet Club. Wow... I did not see that coming. Also, isn't the spoiler more or less in the title? It's not a really a Spoiler anyway, it happened live. This was all a plan by Dixie and AJ to bring the IWGP title to TNA. Only after he brings it to GFW and they "invade" TNA. Just watched it, REALLY good. I thought I read that Devitt was in this.